Dubai: Fad diets have impaired the thinking of people who often go on high fat, low carbohydrate, gluten and dairy free diets, which might be depriving the individual of real nutrition, said Professor Daniele Del Rio, Head of the School of Advanced Studies on Food and Nutrition at the University of Parma in Italy on Tuesday. Professor Rio was speaking on the sidelines of the Arab Health forum at the Positive Nutrition for Prevention of Non-Communicable Diseases (NCDs) symposium. He spoke at length on the role of the Mediterranean diet and its role in reducing the incidence of cardio vascular and other diseases such as diabetes, obesity and cancers. Can one cheat day ruin my entire fitness plan? “There is no reason to go on a specific diet free of something like gluten free or dairy free if there is no medical condition that is forcing you to do that specific choice,” he said of fad diets. “There is no science behind prevention so if you exclude gluten that you have lower odds of getting coeliac disease for example. It doesn’t work like that. Veganism is a choice that has a lot of ethics in it and you need to be careful that you get the micronutrients that you might not get from the diet. One needs to appreciate all the nutrients present in milk, eggs and make sure one really does not miss anything like vitamin B12 that is in meat and try and get it from other sources,” he added. A Global Burden of Disease study conducted in the UAE from 1990 to 2016 said that cardio vascular disease is the leading killer in the country. A recent independent study from the World Health Organisation also found that one in 10 residents live with diabetes and 47.5 per cent of residents are overweight. The University Hospital of Philadelphia has devised a womblike device, called Extend, for premature babies ranging from 23-28 weeks who require a ventilator for eight weeks or more in Neo Natal Intensive Care. 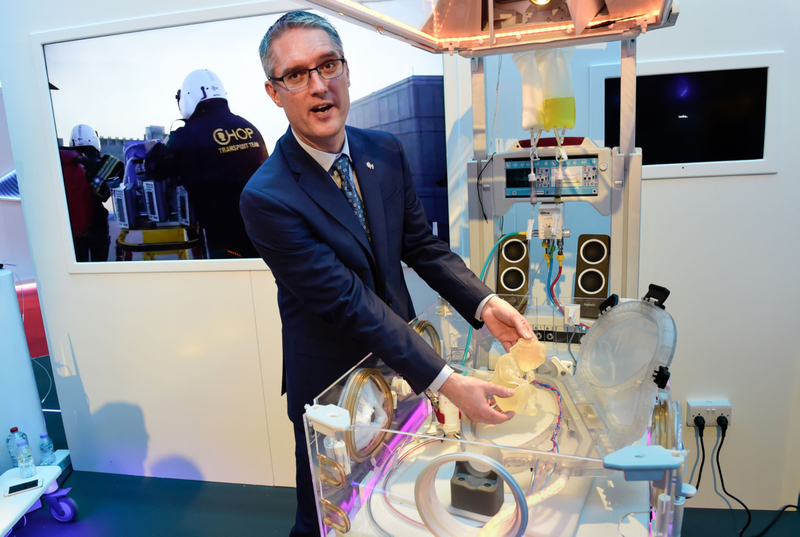 Speaking to Gulf News at the Arab Health forum on Tuesday, its co-inventor Dr Marcus Davey said: “Babies born too premature usually suffer brain and lung damage with the oxygen that is pumped into their blood stream resulting in cerebral palsy and other such conditions. Students from Drexel University in the US, have developed an easy-to-use, early breast lump detection device. iBreast is a non-radiation based, pain-free device that can differentiate between soft and stiff tissue to detect lesions as small as 3mm that would otherwise be overlooked by mammograms. Of the 200,000 women screened in 12 countries worldwide, iBreast has detected 120,000 malignant tumours that were screened and diagnosed well in advance, making breast examination painless and timely, according to Mihir Shaw, who was representing US-based company, UE Life Sciences, in his eight-minute pitch at Innov8 at the Arab Health forum on Tuesday. 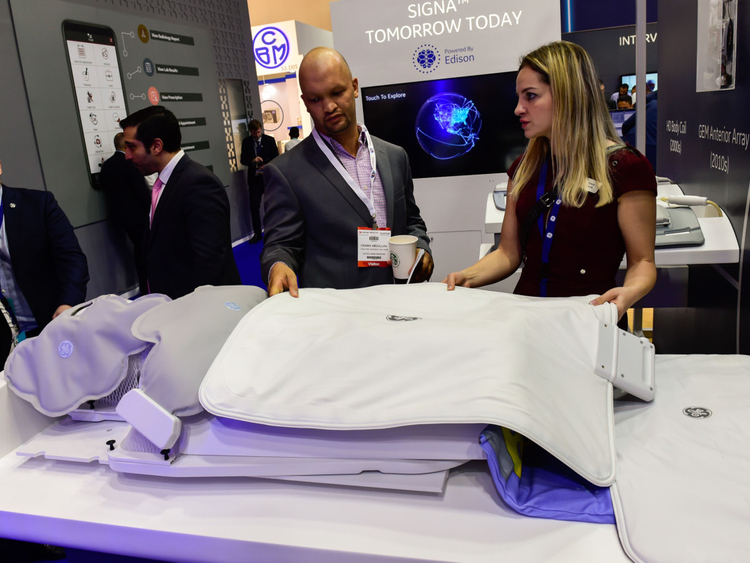 GE technology has devised an industry-first suite of radiofrequency coils that enable total freedom in coil positioning and handling during an MRI scan. MRI is highly effective in imaging patients, however traditional coils can be bulky, heavy and rigid causing discomfort to patients and technologists.